Stop me if you've heard this before: a powerful character, presumed dead for several books, is found revived somehow, yet largely bereft of his memories. Or how about this: after hundreds of millennia, a long-presumed dead member of a powerful yet persecuted race is discovered to be at the heart of something mysterious that transpires on a hither-to unvisited part of the fantasy world. Maybe this will jog your memory: an intrepid band of plucky adventurers, wise-cracking former soldiers, and a likeable yet utterly youthful-seeming bearer of a powerful sword risk their lives and more to uncover the mystery behind a legend of wealth and terrifying danger. Then again, maybe this will seem familiar: after all of these disparate groups begin their journeys, a convergence of sorts takes place and the plot threads resolve themselves in a matter of a handful of pages. After finishing Ian Cameron Esslemont's sixth Malazan-related novel, Assail, I felt as though I had read almost the same book, with almost the same characters, with almost the same progression of scenes and action. It was all-too-familiar reading an account of how characters/groups covered in Esslemont's previous novels (the Crimson Guard, Kyle, the various Elder Races and their epoch-spanning conflicts) work their way from an initial mystery (just what is transpiring on the dangerous, isolated continent of Assail; is there truly a treasure trove to be mountain in the mountains to the north; what is causing the Jaghut-created ice fields to melt; what has happened to the missing T'lan Imass tribes) through encounters along the way until all meet together in the end. If this does not sound interesting, it is perhaps less due to the macro plot developments and more because of a lack of differentiation in the smaller details. On the surface, the various plots would be entertaining in isolation. Seeing the fruition of Kyle's character arc is something that did hold promise before I read the book. The same goes for discovering just what was transpiring at Assail or the reason behind the seeming age-defying Crimson Guard, as over the course of the previous fifteen Malazan books, Esslemont and Steven Erikson had dropped enough hints as to make their resolutions tantalizing for those readers who had read all of the volumes. Yet there were times in the past where certain resolutions did not carry the punch that readers might have anticipated. For every The Crippled God finale, there was the revelation behind Darujistan's Tyrants that fell a little flat. Esslemont's novels especially have been hit-or-miss, with the relative quality of Return of the Crimson Guard or Blood and Bone being balanced by the unevenness of Night of Knives or Orb Sceptre Throne. 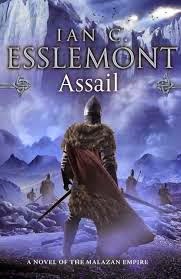 Unfortunately, Assail is among the weaker of Esslemont's novels, not so much because of dampened expectations but because of certain redundancies in his storytelling. The story opens, as do most Malazan books, with a prologue that transpires tens of thousands of years before the narrative present. This itself is not a problem, but when the prologue progression follows so closely to that of Memories of Ice that it is easy to guess what a major revelation will be late in the novel, this lessens the impact of the scene. This important subplot is also hampered in its effectiveness by a lack of development of the conflicts between the living Imass Bonecaster Silverfox and the returning "lost" Imass tribes that still seek their eternal war against the Jaghut. There is little "why" explored, as Esslemont too quickly moves onto a chase narrative for these scenes. Assail also suffers from other half-baked narrative elements. The (re)introduction of a major character is handled rather poorly here. His momentary amnesia is too closely related to that of another returning character in a previous Esslemont novel that it felt as though entire lines could have been transposed from one character/novel to another and little would have been confusing or out of place. This was just sheer lazy writing, as the plot and dialogue should have been better differentiated in order to escape the feeling of narrative deja vu. And yet despite all of these shortcomings, the actual concluding story almost made up for it all. While the convergence plot device is rather passé this far into the combined Malazan series, the conclusions promise a new chapter in this world. In addition, there are certainly enough open threads for both Erikson and Esslemont to explore more of this setting and the new developments revealed in the final two chapters. Certainly Assail is not the end of Esslemont's contributions, despite long-standing claims (the inside flap even perpetuates it) that it would be the conclusion of Esslemont's side-series (Esslemont has signed for three more Malazan-based books). Hopefully Esslemont will not repeat the mistakes of this pedestrian novel and will try to craft something approaching an original narrative progression for his next book. As it stands, Assail is one of the two weakest novels in the entire Malazan sequence. As it stands, Assail is one of the two weakest novels in the entire Malazan sequence. What do you consider the other one to be? His first book, Night of Knives. I find it hard to think that either one is weaker than Orb, Sceptre, Throne (which is a complete mess and boring to boot). Blood and Bone was not great either. Esslemont's best effort was the outstanding Stonewielder. Erikson's best was, IMO, Reaper's Gale, his weakest Toll the Hounds because he left too much to be wrapped up by OST. Yes, OST was a narrative mess, but Assail follows that structure (if you want to call it that) a bit too closely. That's the reason why I think Assail is worse than OST. As for NoK, it just wasn't well-written in terms of style, prose, or characterization. Disagree on BaB, mostly because I liked the sense of looming dread that hung over much of the narrative. Stonewielder was also good, I'll grant. As for Erikson's best/worst, I'd say the best for me was MoI and the worst maybe GotM or DoD, yet even those had more moments of interest than what I've experienced in half of Esslemont's works. Might be as simple as there was a greater sense of import about the scenes in those Erikson books compared to those of Esslemont. As for TtH, I actually liked parts of it, but if you read between the lines of my review...well, you know. May I ask why you consider Gardens of the Moon or Dust of Dreams is the worst? Is reading Esslemont required, or do the Erikson books stand on their own? GotM is out-of-sync in many ways with the rest of Erikson's sequence; a revised text might improve it greatly and make it less choppy and difficult for those beginning the series. DoD takes a bit too long to get to where it's going and then it ends rather abruptly. Neither are actively bad, just more a case that I prefer others over them in the series. As for needing to read Esslemont, no, not really. Certain character arcs are left for Esslemont to complete, but they aren't essential for Erikson's series. But they do provide certain background details that make some of the Erikson novels (mostly TtH) a bit better (specifically, how a certain character arrives to participate in a duel). Other than that, no, they are not necessary to enjoy the Erikson novels. Oh, there are things we find out in the Esslemont books that are good to know: What happens to Lasseen, for example.